Today marks the 10th anniversary of the unsolved hit & run death of a 17-year old from rural Manitowoc. 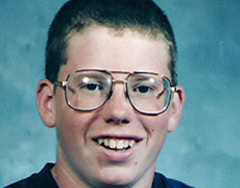 Richard Hochstettler, a junior at Lincoln High School, was struck and killed while walking on the shoulder of County Trunk CR, near his Town of Newton home, during the early-morning hours of January 10th, 1999. WOMT interviewed Manitowoc County Sheriff Rob Hermann and Richard&apos;s mother, Debra Hochstettler, about the case. “There&apos;s somebody that knows, in addition to this person who killed him, somebody else knows who did it,” said Debra Hochstettler. “Somebody knows who killed him, and there also keeping that secret.” Hochstettler said that even though her son&apos;s death was 10-years ago, it seems like it was just yesterday. At the accident site, investigators found a small piece of grill from a 1985-to-&apos;88 Chevy Blazer, Suburban or pickup truck. Hermann said they followed up on leads, but nothing panned out. Even with that evidence, investigators faced a daunting challenge. “We did do a check, and obtained over 12,000 registered vehicles of that make, model and type,” said Hermann. Grill pieces were sent to the FBI for testing, and the state Division of Criminal investigation assisted in the probe. A $26,000 reward has been offered in an attempt to solve the crime. Hermann said anyone with any information on the hit-and-run death of Richard Hochstettler should call the Manitowoc County Sheriff&apos;s Department at 920-683-4201, or if they&apos;d prefer to remain anonymous, contact CrimeStoppers at 920-683-4466. To learn more about the case, you can go to the family&apos;s website .